Only What’s Necessary: Charles M. Schulz And The Art Of Peanuts by Chip Kidd and Geoff Spear. Abrams, 2015. 9781419716393. 304pp. Sarah: People ask what is the use of core strengthening classes? Look, I can grab a book from behind me and move it out front. Gene: (revealing the book with a flourish) A heavy book like Only What’s Necessary? Gene: It’s beautiful, so you can tell at a glance that it was designed by Chip Kidd, who is the best book designer in the world because he’s the only book designer I can name. S: And I can’t stop touching the cover because the ink that makes up Charlie Brown’s face is in relief. G: The thick boards make it feel like a box, so they give reading the book the sense of opening up a box of treasures. The endpapers are comic strip art. But after the title page, there is a two page spread of those tiny paperback Peanuts comic collections we grew up with. These pictures elicit pure joy from me because I read them as a kid. They’re creased and imperfect and wonderful. S: I have no idea why we loved Peanuts and Garfield so much because I think we didn’t get any of the jokes! G: I disagree — I think we did. Chip Kidd has designed several books on comic books for Abrams. One is on Batman, and it’s full of objects and art from Kidd’s collection. It’s also got what I think is the first Batman manga translated and published in the US. It convinced me that I don’t need to own every collectible that I love, I can just have photos of them. Then Kidd did a similar book on Shazam, who was my favorite superhero when I was a kid. I think I loved him because he’s a kid who magically becomes a super powerful adult. And this is his Peanuts book in that vein. It is full of so many amazing things. S: Is that an ad? G: It’s art for a Peanuts ad newspapers could run. They could paste in the name of their paper and print it. There are also sketches and finished art, with clear corrections on some of the pages. The book was done with the help of the Shulz Museum & Research Center in California where they have this mural of Peanuts strips on ceramic tiles that form a picture. This is a Ripley’s Believe It Or Not! comic that Shultz was published in when he was 14 — that’s a drawing of his dog. G: Here’s a photo of him as a little kid. He looked the same when he was an old man. When Shulz served in WWII he illustrated his friend’s letters home to his wife, and here are photos of those. G: He later did some one-panel gag comics. Look at how simple his drawings are, and how easy he makes cartooning look. Even in the sketches it’s clear how nearly perfect his design is. I love the photos of the original Peanuts art in here. I had a book that was enormous, full of Peanuts art published at the size of the originals. It was too big for any shelf in my house. But there’s something about the art photos in this that I like better. Maybe it’s the clear imperfections. Here’s art from Li’l Folks, which preceded Peanuts, and then from Peanuts itself. There are not only photos of original art, there are photos of proof sheets sent to newspapers — a week’s worth were sent at a time. The fact that they’re on aging newsprint gives an idea of how old they are. Are we the last generation that’s going to know what aging newsprint looks like? S: There’s a strip in Cheeming Boey’s book of autobiographical comics where he talks about eating corn on the cob like a typewriter and saying *Ding! * at the end of the row. And I was like, wait a minute, there’s an expiration date on that hilarious childhood jape. G: Here’s the Peanuts View-Master reels. I had one as a kid but never thought about it. Someone made clay sculptures of Peanuts scenes and photographed them in 3D for this. S: That was a whole weird genre of claymation with very few frames. G: It looked like Wallace and Gromit. Schulz attended, via a correspondence course, the Federal School of Applied Cartooning, later know as Art Instruction Inc. So let this serve as a pitch for them. 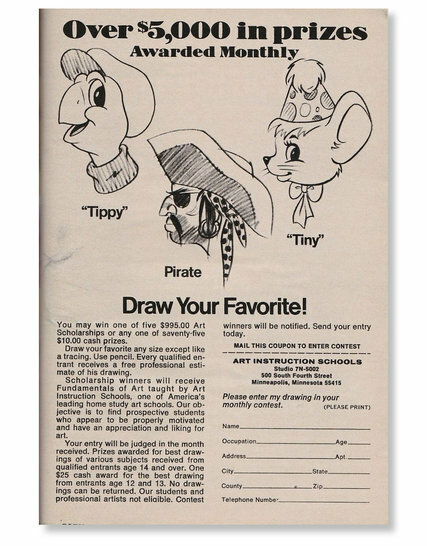 S: Were they the ones who had you draw Tippy? G: He wrote and illustrated several other books, including “Teen-Ager” Is Not A Disease. This is a section of things he did that aren’t very famous. Here’s a supplement (fully reproduced) that he did for Good Housekeeping, “Charlie Brown’s Christmas Stocking,” which predates the Christmas TV special by two years. S: The originals! With the pasted down text. G: It reminds me of how primitive all of this was, about how much of it was done by hand. Here’s the braille edition of Happiness Is A Warm Puppy, with text on one page and the drawings in relief on the next. S: They’re photographed with a lot of shadow so they’re easy to see. G: And this is from after Dr. Martin Luther King Jr was killed. Harriet Glickman, a housewife from Sherman Oaks wrote Schulz to say maybe you should have a black kid in Peanuts. So this is how Franklin joined the cast. Her letters, plus a letter from someone she shared his initial response with, as well as Schulz’s letters back, are reproduced. Schulz was worried about being patronizing, and then Glickman responded to that. She showed his response to her friends, and then they wrote him. Kenneth C. Kelly’s argument that such a character would “…ease my problem of having my kids seeing themselves pictured in the overall American scene…[and] it would suggest racial amity in a casual day-to-day sense” seems to have gotten through to Schulz. Franklin appeared in his first strip , playing with Charlie Brown at the beach, about a month later.